Delicious Jams and Pepper Jellies! 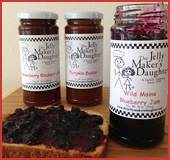 "The Jelly Maker's Daughter®" in Kittery, Maine, offers the jams and preserves, pepper jellies, and fruit butters. Our company is pleased to be involved in many events some to be announced. This is a great opportunity to meet with friends and sample our delicious products. Make sure to visit our online store to purchase any one of our delicious products!